In this new novel from the USA Today bestselling author of The Dressmaker's Dowry, two young women two generations apart discover the joy and heartbreak of following their dreams. Aspiring Hollywood actress Violet makes a shocking choice in 1940, and seventy years later, Mari sets out to discover what happened on that long ago summer. 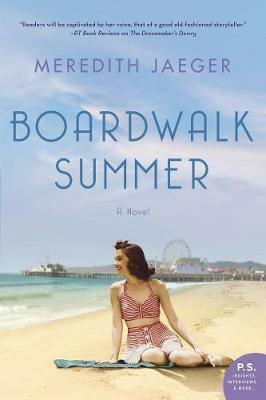 Santa Cruz, Summer 1940: When auburn-haired Violet Harcourt is crowned Miss California on the boardwalk of her hometown, she knows she is one step closer to her cherished dream: a Hollywood screen test. But Violet's victory comes with a price--discord in her seemingly perfect marriage--and she grapples with how much more she is willing to pay. Summer 2007: Single mother Marisol Cruz lives with her parents in the charming beach cottage that belonged to her grandfather, Ricardo, once a famed performer on the Santa Cruz Beach Boardwalk. Drawn to the town's local history and the quaint gazebo where her grandparents danced beneath the stars, Mari sells raffle tickets at the Beach Boardwalk Centennial Celebration, and meets Jason, a California transplant from Chicago. When Mari discovers the obituary of Violet Harcourt, a beauty queen who died too young, she and Jason are sent on a journey together that will uncover her grandfather's lifelong secret--his connection to Violet--a story of tragedy and courage that will forever transform them. What happened on that long-ago summer? In this riveting novel from the author of The Dressmaker's Dowry, an aspiring Hollywood actress makes a shocking choice in 1940, and seventy years later a young mother sets out to discover what happened . . .
Summer 1940: When Violet Harcourt is crowned Miss California in her hometown of Santa Cruz, she's determined to see herself on the silver screen. But Violet's pageant victory comes with a price--cracks appear in her seemingly perfect marriage--and she quickly discovers Hollywood is not the glittering escape she dreamed of. So she makes a bold decision, leaving her name in headlines and her fate a mystery. Summer 2007: Single mother Marisol Cruz lives in a charming seaside cottage that belonged to her grandfather, Ricardo, once a famed performer on the Beach Boardwalk. Drawn to her town's local history, Mari embarks on a journey that uncovers her grandfather's lifelong secret--his connection to a beauty queen named Violet who died too young--and a story of tragedy and courage that will forever transform her.